Originally published under the title "To Be Kind Is To Be Cruel, To Be Cruel Is To Be Kind." Alan Kurdi, 3, drowned last year in a failed attempt to sail from Turkey to the Greek island of Kos. Just after the September 2001 attacks on the World Trade Center, I warned that radical Islam would horrify the West into submission. In Europe, it has taken a giant step towards success. Europe's horror at the prospect of human suffering has made it supine. Sadly, the more the Europeans indulge in their humanitarian impulses, the more Muslims will suffer. To be kind is to be cruel. The 240ft Monica had been spotted in international waters during the night. When Italian coastguard boats drew alongside, the crews were shocked to see men and women on board begin dangling the infants over the side. The refugees – mostly Kurds and many said to be heading for Britain – calmed down only when they were assured they would not be turned away from Italy. The Archbishop of Catania, Luigi Bommarito, was at the dockside to greet the Monica in what he called "a gesture of solidarity". He said: "I'm here to appeal to people not to close their hearts and doors to people trying to survive. We mustn't forget that in the last century many immigrants also left Italy." We can open the doors to Greece and Bulgaria anytime and we can put the refugees on buses, What will you do with the refugees if you don't get a deal? Kill the refugees? 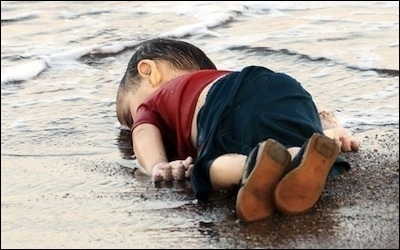 the EU will be confronted with more than a dead boy on the shores of Turkey. There will be 10,000 or 15,000. How will you deal with that? When in world history has one side in negotiations threatened to kill its own people to gain leverage? The leader of a prominent Muslim country who claims to speak for the Muslim world threatened the Europeans with 10,000 to 15,000 Muslim deaths. When in world history has one side in negotiations threatened to kill its own people in order to gain leverage? Some Europeans suspect that Turkey deliberately encouraged the mass migration that hit Europe in the summer of 2015 by allowing criminal gangs free passage through its territory and across its borders. That is difficult to prove, although it is hard to understand how tens of thousands of Afghans, Iraqis, and Pakistanis made their way through Turkey to Europe without some degree of Turkish collusion. Future investigators will have to settle that issue; what seems clear from the leaked transcripts is that Turkey has turned the migrant crisis into weaponized horror. The same grisly farce has played out for years in Gaza, where Hamas fires rockets at Israeli population centers from civilian locations, including schools and hospitals, and then complains of human rights violations when the Israelis respond and on occasion kill civilians. Col. Richard Kemp, the former commander of British forces in Afghanistan and an expert on the conduct of war on Israel's borders, observes that the Gaza civilians are not human shields, for their purpose is not to shield anything. Rather, they are human sacrifices, intentionally set to die. Hamas uses civilians not as human shields, but as human sacrifices, intentionally set to die. This is the first time in the entire history of warfare that a combatant intentionally set out to maximize civilian casualties on its own side, the better to gain diplomatic leverage. Hamas has read the West well: the reflex response of the secretary general of the United Nations, the European Commission, presidential candidate Sen. Bernie Sanders, and the rest of enlightened world opinion is to recoil in horror at hundreds of civilian casualties, and to denounce Israel for excessive use of force. Hamas knows what will come out of the mouth of Ban Ki-Moon or Sen. Sanders as surely as I know that a gumball will come out of the machine when I crank in a quarter. Palestine is an international issue. [The issue] won't be decided in a flurry of knives or acts of martyrdom [suicide attacks], or in protests or demonstrations. It will end only when the world understands it has a duty to intervene and to draw borders and lines, as it did in Bosnia-Herzegovina, in Kosovo... One might ask: How long? And I say: The day will come. ... One might ask: Did the peaceful struggle bring about the end of the occupation? And I say: Did the military and armed struggle do so? .... Only the world can bring the solution. The West has not imposed a "solution" on Israel only because Americans respond to weaponized horror differently than the UN bureaucracy, the Vatican, or the government of Sweden. Fully half of Americans support a ban on all Muslim immigration to the US. Elsewhere in the Anglo-Saxon world, the tide of Muslim migrants might tip the balance in the upcoming June referendum on British membership in the European Union. Perversely, the United States created a monster when the Clinton administration went to war with Serbia in 1998 in order to rescue the Kosovo Liberation Army–a dodgy band of Albanian hoodlums engaged in drug and human trafficking–from the harsh response of the Serbs to their provocations. Muslims like Mohammed Daraghmeh learned that at least some in the West would take their side in order to stop humanitarian disasters, even if the Muslims themselves set those disasters in motion. The Pope, the U.N. secretary general, and Sen. Sanders encourage the creation of such disasters by responding according to script. Al-Qaeda wants no territory, no conversions, no loot, no slaves. It wishes to destroy the West and happily will sacrifice millions of Muslim lives in order to do so. Indeed, the mass sacrifice of Muslim lives may lie at the heart of its battle plan. It has more in common with the Dostoyevsky of The Possessed or the Wagner of Die Goetterdaemmerung than with the Muslim conquerors of the Middle Ages. Evil for its own sake becomes imaginable only when the Christian civilization of the West abandons Christianity and stares into the abyss of its own destruction....The grand vulnerability of the Western mind is horror. The Nazis understood this and pursued a policy "des Schreckens" (to cause horror) and "Entsetzens" (terror, literally: dislodgement). Horror was not merely an instrument of war in the traditional sense, but a form of Wagnerian theater, or psychological warfare on the grand scale. Hitler's tactical advantage lay in his capacity to be more horrible than his opponents could imagine. Muslim leaders from Raqqa to Ankara have learned to weaponize horror in order to blackmail the West. What would be required to persuade the likes of President Erdogan that the West will not accede to blackmail? Sadly, the West would have to watch with indifference as horrors unfolded on its borders. The Pakistani who threatened to hang himself earlier this month at a refugee camp in Lesbos will not go back to his miserable life in Pakistan unless the alternative at a European refugee camp is even nastier. To be kind is to be cruel: it encourages horrific outcomes staged to manipulate the Western conscience. Paradoxically, to be cruel is to be kind. German attitudes towards the refugee crisis are sadly understandable, given the lingering trauma of the Second World War, as I wrote in this space recently. Nonetheless, Germany should round up most of its migrants and send them back to their own countries. That would be a difficult and nasty business. Germans object that they do not want to be concentration camp guards. But that is no excuse; they could hire Ukrainians, just like last time. Another perverse outcome is the reemergence of Russia as a Middle Eastern power. President Vladimir Putin is not a new Stalin, but rather the last European leader in the mold of 19th-century nationalism. His relative success in Syria stemmed in part from his indifference to collateral damage and his willingness to use Russia's Cold War inventory of dumb bombs. It would be a tragedy for the West if the initiative in crisis response passed to Russia (and perhaps China), simply because those powers lack the constraints of conscience that inhibit the West.